A couple of weeks ago I had a hand in putting together a pod cast with my friend Luis and Radio Juventud. This was when the new law prohibiting taco trucks from parking in the same spot went in to affect or they got slapped with a $1,000 fine and possible jail time. I had a great time doing it and it was definitely a great learning experience working with Luis. It’s in spanish, which shouldn’t be any problem I hope. Tu Ciudad, May 2008. Never received the June issue. 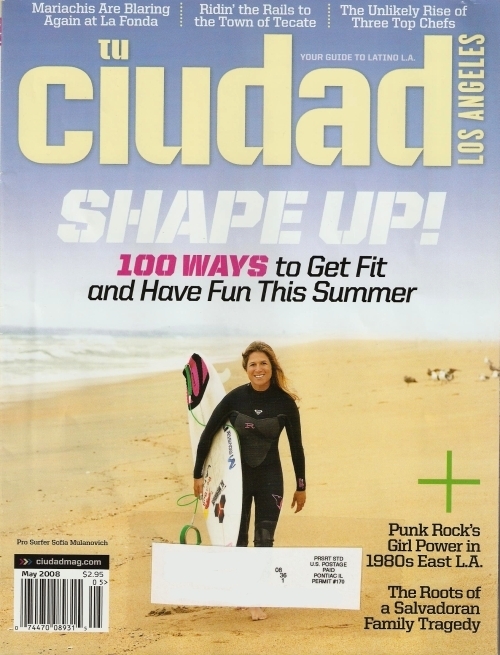 According to LA Observed, Tu Ciudad, the magazine aimed at upwardly mobile “acculturated Latinos” (chuppies?) in Los Angeles has folded. I have mixed feelings about the magazine’s demise. In the magazine’s first year, I really enjoyed the articles and their LA based coverage. Lately though, it seems like the writers and editors are all living in Brentwood or something because almost nothing in the magazine interests me. Each page was filled with mundane things I couldn’t afford to buy and the articles were a bit boring. On the other hand, I did look forward to reading it for the occasional guest writer and because I enjoyed smirking and rolling my eyes at the people and businesses they were promoting. It was obvious they all ran in the same circles and worse yet, it seemed the staff rarely ventured over to the Eastside. I’m basing this assumption on their frequent exultations to Loteria Grill. There are at least four restaurants in Lincoln Heights alone better than that bland cuisine. 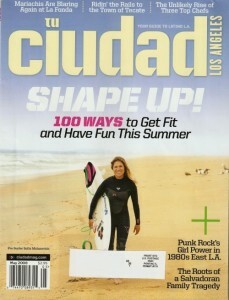 Well, Tu Ciudad you made a decent attempt, but in the end I bid farewell to your good idea/bad execution magazine! Anyone else shedding crocodile tears for Tu Ciudad? Hmmm, I wonder what will happen with my subscription? Posted on June 14, 2008 by EL CHAVO! 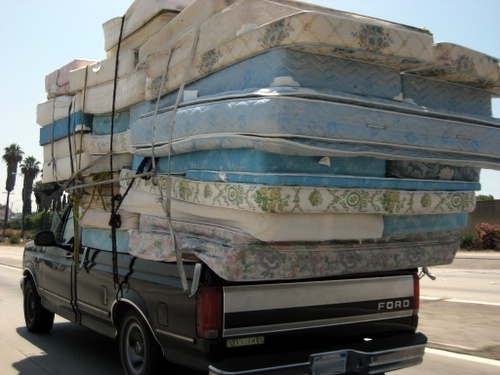 It’s always kinda fun and just a bit scary to drive by one of those overloaded trucks you are bound to eventually see on the freeways, but this awesome sighting of bouncing and swaying colchones on the 10 is dedicated to Doña Junta, who happens to think the word itself is funny enough just to say. Colchones, colchones, colchones! One more pic after the jump. Click through for more videos and a drawing for a free book! Me and “the flats” have along history together (btw, that foto is from flickr). I lived there in the PJs for several periods of my life and had familia who stayed there as well until they tore down the projects, after we left I still came around to cause trouble, make money and pick up on girls as a “weekend warrior”. 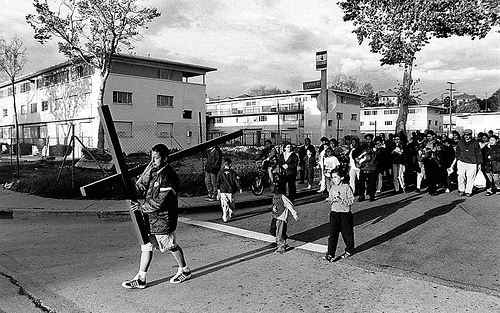 When they tore down the largest collection of projects on the west coast in the late 90s/early 2000s, they squeezed much of the barrio into the smaller more run down neigborhood between the Pico Gardens and Aliso Village complexes, helped push the existing gangs into other neighborhoods (which never disappeared) and made a lot of people angry and bitter. I have mixed feelings about this because the area was pretty rough and a concentration of trouble is a bad recipe, but for christ’s sakes they didnt even replace the new complexes with a competent number of low income housing units, opting instead to section 8 folks away so that their cholito kids can start up clickas in other complexes around LA, real smart. I believe they tore down 600 units from Aliso village alone and replaced it with 400 units, half of which were market rate. A bit of history and info on this area: It was always a pocket of poverty since the pueblo days of LA. 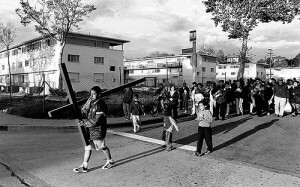 it was the low land between Boyle Hts and the LA River, and attracted poor immigrants, mexicans blacks and indios as the land flooded a lot, originally even the poorest farmers let their animals graze in the location. I didnt know until recently, but the flats actually was sort of L shaped and extended to the area where the Estrada Courts (VNE) projects lie, all at the foot of the hill starting boyle hts and east of the LA River. This area was carved up big time when the freeways, and specifically the East LA interchange, were built in the 50s, but in my world the flats went from the hollywood freeway (top of the Alisos) to the lower end of the Pico Gardens projectos (under the whittier blvd bridge). I read that back in the day molokkan russians also had a strong presence in the area, and up until the racial beefs of the late 80s/ early 90s, the projects were the only ones in East LA with a large black community (which had implanted a strong love for LA’s black culture and population in me that is sadly not present in a lot of Latinos). So anyways, I took some flicks when I was down there recently checking out the goldline. I rarely stop by and say hi to the folks I knew, as that was the “bad me” part of my life and most of my maintained contacts were involving illicit activities or gang drama, things I now avoid as a soccer mommy. Here is the tip of my picture trove iceburg, maybe one day I’ll pull out my childhood project pics (which my mom had thought she destroyed years back out of the embarassment of the fact that we lived there, thats a whole nother story and therapy session). Being used to bike rides usually starting further west of my home, I found this ad in The Voice which is a local news periodical pretty interesting. I rarely, if ever, am a part of Midnight Ridazz or Critical Mass since I like rides in small groups. But this might be different so I sent them an email yesterday, but have yet to get response. Maybe they’ve been inundated with a huge response because folks are hopping on two wheels because $4.58/g is causing some hurting. Is it a day-ride, a night-ride, a tour of the Eastside ride? I’m down for this. I personally enjoy riding through Lincoln Heights with it’s relatively slow traffic and wide residential streets. 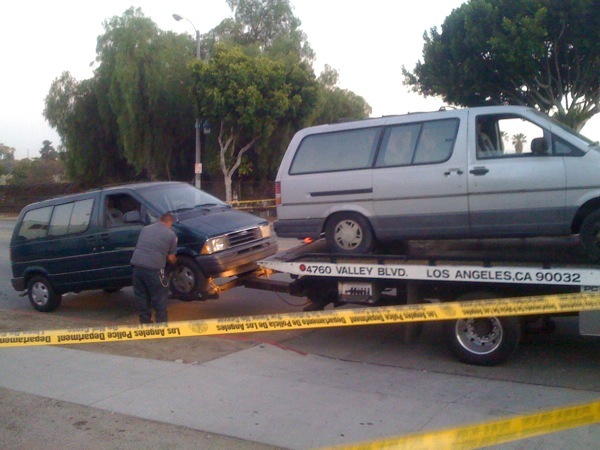 But I do hate going down Eastern Ave. in El Sereno because it’s a narrow street where SUVs try their best to scare the sh*t out of me with their horns. 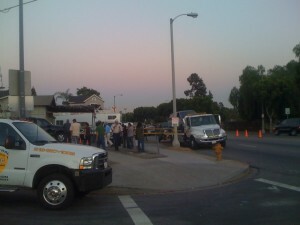 Now Boyle Heights, that’s a part of town I’d like to try to ride through. If you get a response, let us know what these “The Voice” people are up to! Produce section, “Buzz Buzz Buzz“, The Hollywood Flames. 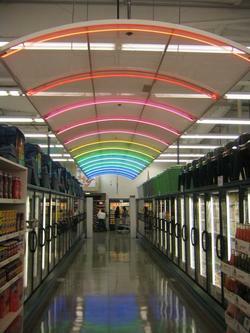 Produce section, “Love Will Tear Us Apart“, Joy Division. Meat section, “She’s Not There“, The Zombies. Posted on June 12, 2008 by EL CHAVO! 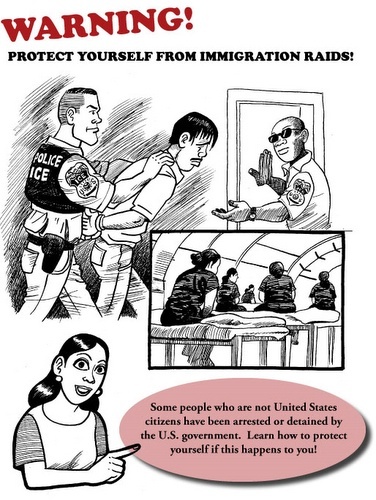 Random Hero uploaded some images on his blog of a useful guide to help protect those that might be facing some of the Immigrant roundups that have been happening across the nation. It’s a pamphlet with some basic pointers to remember, info worth reading over to share with friends or family that might need some guidance, in case that day comes. Here’s a link to the Spanish version. How pathetic is that? At a time of increased unemployment, housing foreclosures, and a meteoric rise in gas and food prices, the miserable little bastards in power think it makes sense to start busting up homes and workplaces, just to appease some other miserable little bastards. What a waste of resources. It’s sad that there is a need for pamphlets like these but I’m glad to see some seeds of resistance being planted; I don’t think the xenophobes are going to have it as easy as they imagine. If you listen to Spanish language radio you’ll know that people are always calling in to share reports of traffic stops, giving the intersections of major police activity, thus helping others from running into a legal trap. You gotta love mutual aid! 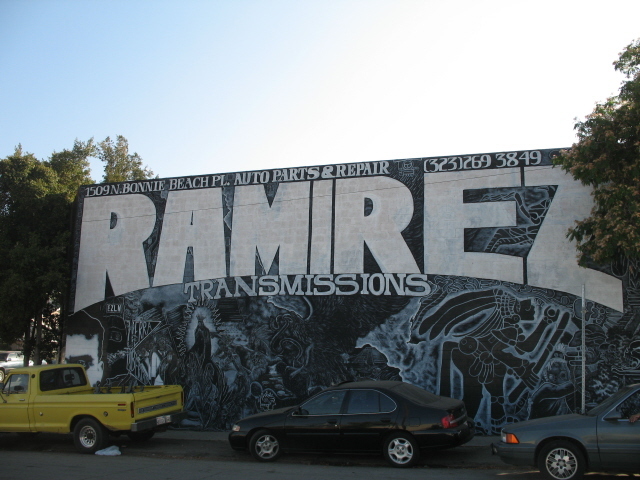 This Ramirez Transmissions mural really caught my attention, mostly because the huge blockbuster roller letters, they really stand out boldly and proud.The work was mostly hand painted with acrylic and brush, but it also looked liked they used spray paint for some parts. The beloved Chicano/Aztec drawings and symbols were quite detailed too. First Tía Chucha’s Centro Cultural and Bookstore was booted from it’s original location in San Fernando. The space is now reportedly a laundromat. 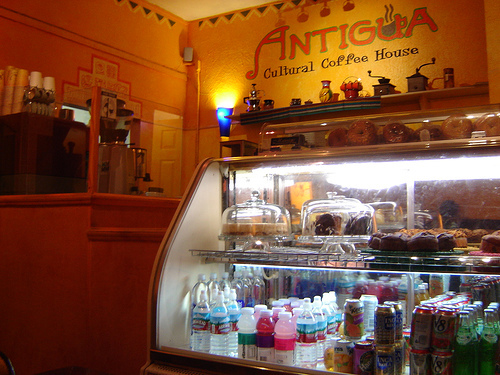 Now, Antigua Cultural Coffee House will close the doors of its El Sereno location. They’re “getting evicted or just simply not being granted a contract extension.” In three weeks they’ll be gone… but never fear, their Cypress Park location will open later this summer. Yancey, co-owner of Antigua, calls his coffee shop “the envy of the West side.” I can’t argue with that as evidenced by my reaction after my first visit in August 2006. Since then, I’ve found a coffee shop in Culver City where the owner notices when I haven’t visited in a while. It’s cool, but it’s no Antigua. I visited Antigua a few weeks ago for a monthly meet up with fellow Latin@ bloggers. The meetings are a fun time to just catch up, support independent small businesses on the Eastside and talk about current issues. The next gathering will be at Antigua on Wednesday June 18th at 7 pm. 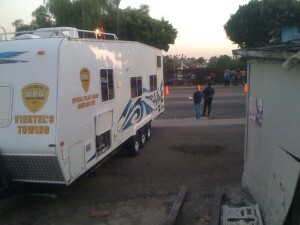 For more info, check out Eastside Scene. If you’ve never been to Antigua or met a fellow blogger, you should stop by. I always leave the gatherings feeling that the trek from Westwood was well worth it. Email announcement from Yancey, co-owner of Antigua after the jump. While I was enjoying SOLEDADENMASA‘s last post, I was inspired to this pendejada. “The Vatos That Time Forgot”. I mean, image wise, the Chicano homies & hainas appear to be about 20 yrs. behind the current SoCal look. It appears that the Vato look has evolved here in L.A. over the years, but outside of here it’s still predominantly the Pendletons-khakis and bandanas “Retro-Homie” look for the guys & girls in that scene. Is it just me or has anyone else noticed this? Also, It almost seems that socially & politically they are only recently going through the growing pains we did here in the 70s-80’s. Could it be that the demographic is finally reaching critical mass in other places and is only now mirroring the SoCal Chicano (r)evolution of previous generations? That would mean that we here were, to some great degree, the pioneers & prototypes for the American Chicano model in this country, even going back to the Pachuco days. That’s Cool! tangent/addendum-I give those older Chicano generations all the respect they deserve. They had to forge a hard fought path in establishing an identity within a society that wasn’t near as accommodating or sympathetic as we have today, and they did it on Huevos alone. Here’s to you! Salúd Carnales!